In 2010 government of Punjab has approved to establish Gujranwala Medical College in District Gujranwala which is 6th largest district of Punjab. The first intake of the GMC is about 100 students in the year 2011. Temporarily the classes are held in the building of Home Economics College. The permanent building of the GMC is under construction which has hostel facilities, state of the art lab facilities and other department’s buildings. Prof. Dr Atiya Mubarak Khalid is the founding principle of GMC. Under construction campus of Gujranwala Medical College have hostels facilities for boys and girls, staff residences, offices, basic sciences departments, staff colony and cafeteria and other necessary infrastructure. Well-equipped labs are available in each department for the Students where they can perform practical. Fully functional library is also available in the campus with many essential books for the students. The GMC has a teaching hospital where students perform their clinical practice for the respective subject. The degree of the college is recognized by Pakistan Medical and Dental Council (PMDC). Currently Gujranwala Medical College offers bachelor in Medicine and bachelor in Surgery (MBBS) degree. It is a 5 years of academic study program. The curriculum of the courses is design and up to date by the regulations of PMDC accordingly. Admission by the college offers annually. The intake of students in college is 100. Recently the second batch of the 100 students is promoted to their 2nd professional year (part II). The GMC 2nd batch shows best result is public sector medical colleges and leading in all over Punjab by securing 98% success ratio. Admission forms are available at the website of UHS. Admission process in the college will start after the result announcement of government medical and dental college entry tests. FSC pre-medical or equivalent certificate is necessary for taking admission. Students with 82% marks including HSSC, SSC and aptitude test calculating PM&DC formula are eligible for admission. District Headquarter Hospital Gujranwala is affiliated with GMC as teaching hospital where all major specialties are available like Medical, Orthopedics, Pediatrics, Eye, Surgical, Gynecology, Urology, ENT, Neurosurgery and Cardiology etc. The hospital comprises of 472 beds and become teaching hospital with the inception of GMC. Which Medical College is best for MBBS In Pakistan? Which College is best for BDS in Pakistan? Thanks for visiting our site which is compatible of Universities Admissions and details. 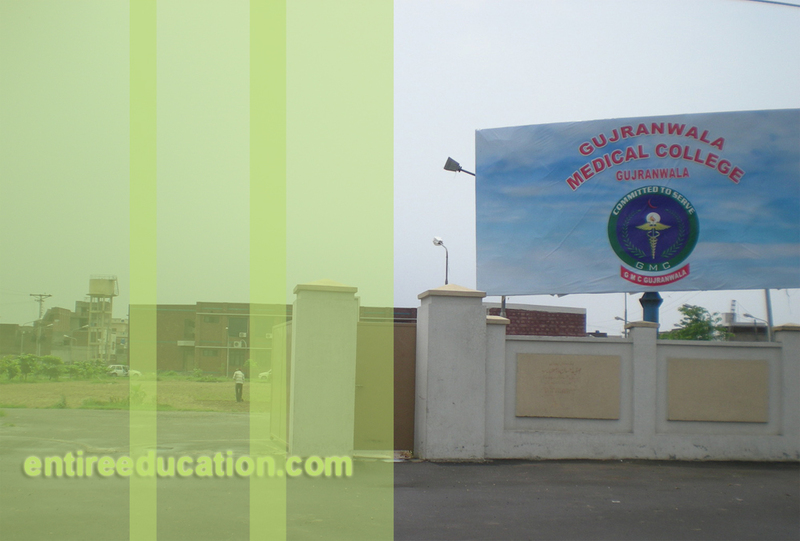 We provide the best information about Gujranwala Medical College Admissions 2018. What is age limit for admission in BDS?